Have you ever bought a bag of potatoes, but couldn’t think of anything to do with them? Of course not! You can do practically anything with potatoes! Boil em, mash em, stick em in a stew (sorry, I couldn’t resist). 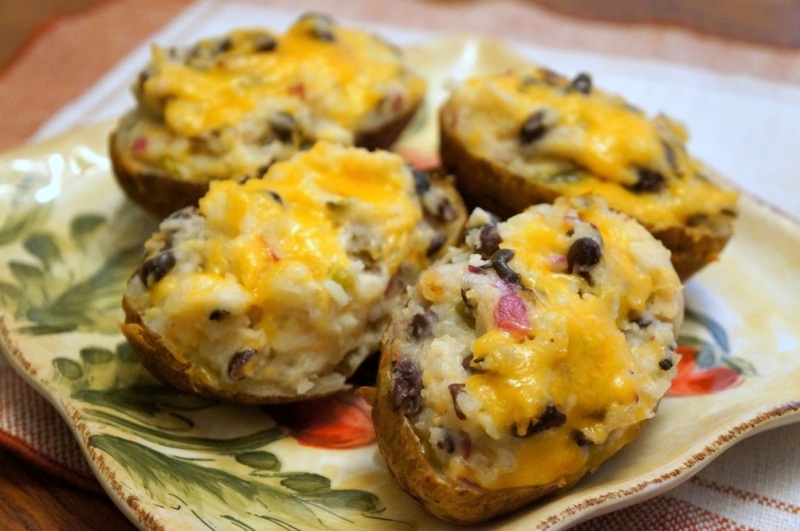 They can be initially time consuming, but if you bake them in advance, you can quickly make roasted potatoes, homemade French fries, potato salad, and now these delicious twice baked potatoes. You’re welcome. I got the idea for these from a cheesy bread recipe my mom used to make when I was a kid. She would scoop out the inside of a long piece of French bread, mix it with cheddar cheese, red onions, olives, and mayonnaise, then put it back in and bake it until bubbly and delicious. 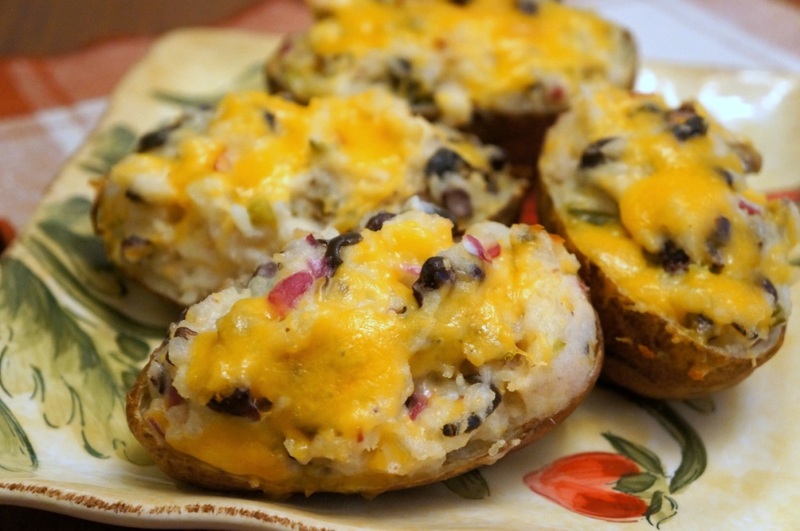 It was always the first thing to go at any party, and I thought it would be easy to adapt to twice baked potatoes. I was planning to make them ahead of time for dinner tomorrow, but we ended up eating most of them tonight. I think that means they’re blog worthy! Bake 3 large potatoes at 375 for about 50 min. Before baking, poke holes in them with a fork and rub them with a little olive oil to keep them from drying out. This can be done a day ahead of time if preferred. 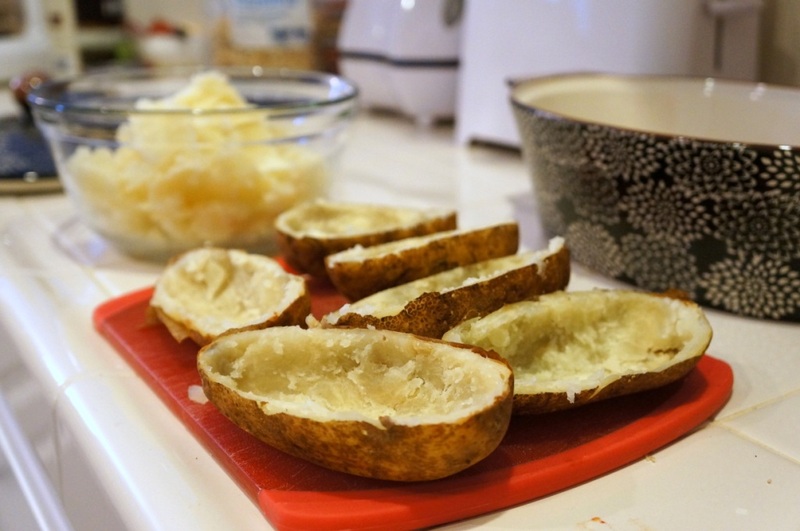 After the potatoes are baked and have had time to cool down, cut them in half and scoop the insides into a mixing bowl, making sure to leave some of the potato attached to the skin so the shell doesn’t cave in. 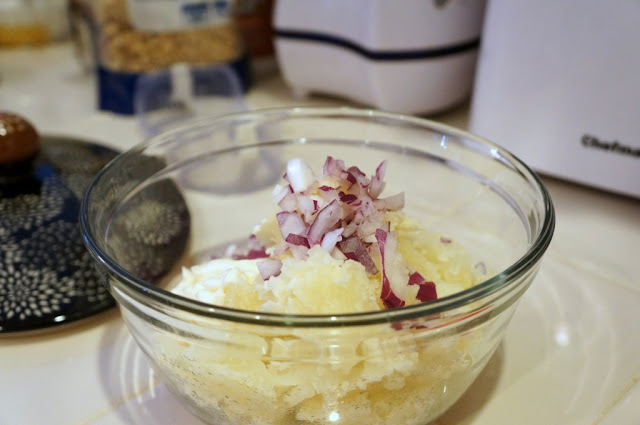 Add the onion and mayonnaise to the bowl and mix until pretty smooth. Add the rest of the ingredients and mix well, reserving some of the cheese for topping. Now you can start stuffing your potatoes. Don’t be afraid to mound the filling. I was worried that they might spill over, but I had no problems with it. I ended up with a little extra filling, but I think I could have just added it on top. Once your potatoes are to your liking, bake them in the oven for about 20 min at 375 degrees to heat through. After about 20 min, pull them out, add the rest of the cheese on top, and continue baking until the cheese is melty (just a couple more minutes). These turned out so good. Even though I added a few things that weren’t in my mom’s original recipe, and I used potatoes instead of bread, it tasted pretty much exactly how I remember. There is something about that cheddar/mayo/olive/red onion mixture that goes really well together. My only regret is how many I ate…now I feel like a stuffed potato! One thing I might do differently next time is to try substituting some of the mayonnaise with a little sour cream to cut down on the fat. If you give it a try let me know how it turns out! Note: I only made 6 servings because any more than that would go bad in our house. 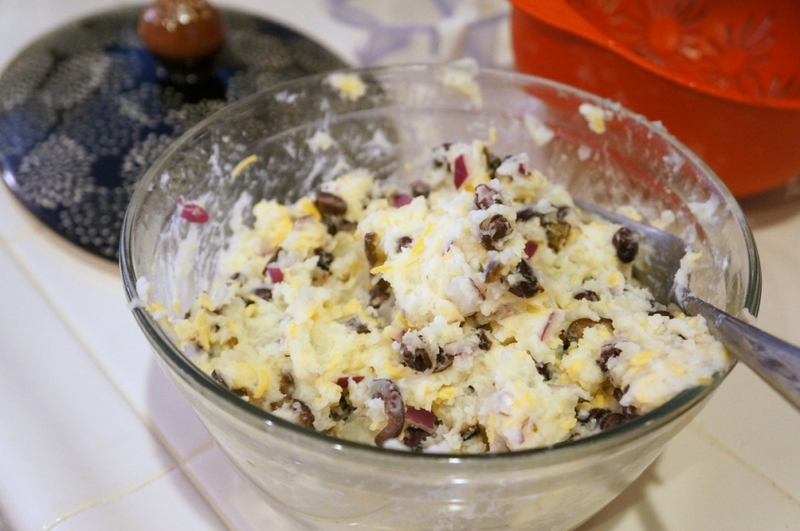 This left me with leftover beans and olives that I can use for other things, but you could definitely make more potatoes if you want to use all of your ingredients.